[20:30] On Facebook, don’t add members to a discussion, invite them instead. [33:20] Add me and message me is Adam’s five magic words. 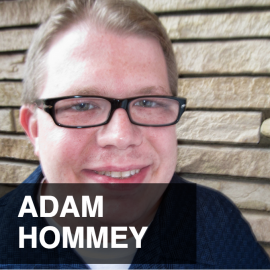 It’s my pleasure to weclome Adam Hommey to the show. He is founder and creator of Help My Website Sell and the Business Creators Institute. He has taken his passion for helping small business owners and business creators, just like you, win in the game of business and marketing and help you in putting that all to work for you. So, Adam, welcome, how are you? Jason, thank you so much for having me. It’s an honor and a pleasure to be here and I really look forward to sharing some great information that will help your listeners. Yeah, absolutely. Well, thank you so much for having that great contributor’s attitude and just before we start, I loved the way you answered the question when I said that common question, how are you? You wanna share that with the audience? Ahh, yeah, certainty. I, myself, being a classic introvert personality, the one question I dread in any conversation really is ‘how are you?’ or ‘what you up to?’ or ‘what you doing tonight?’ or ‘what’s for dinner?’ My answer to all of these question is fine, great, I don’t know. I really would prefer to steer the conversation where it’s something a little more excited and a little more engaging. So you ask me how I’m doing, I’m going to tell you how I am going to help you. But, that was a great answer you had. You said, I couldn’t be any better if you gave me a million bucks, but please go ahead. That was the awesome answer. Oh, yeah, you’re referring to what we were talking about in the green room. When we first got into the green room and you asked me how I was doing and I said, I couldn’t be better if you paid me a million bucks. However, that shouldn’t discourage you from trying anyway. That is awesome. I loved that. Best answer I’ve ever heard. There used to be this guy at one of the offices I used to work. His name was Bob and you’d say, how are you doing, and he only had two answers, Adam. One was really positive and one was kind of negative. One was, “If I was doing any better, I’d owe the world a rebate,” and then he say, if he wasn’t doing so well, he’d say, “How are you doing, Bob?”, “Better than nothing.” So, there you go. Anyway, now that we are off on a huge tangent here, tell us about discussion groups and why that’s important and how and why entrepreneurs should use them. Jason, when we talked about social media marketing, the conversations that come up are, how to get more engagement on our Facebook fan pages, how to get more LinkedIn connections, how to get more follows on Twitter, how to get lower cost per click on our ads. These are the most common things that come up when we talk about social media marketing. When we talk about social media management, it becomes, well, who do we outsource to, who do we get to manage our social media for us, or as some will say, who can I hire to do my Facebook. Well, there is a resource in front of every entrepreneurs and every business creator that is so rarely talked about even though just about everybody’s doing it. On Facebook and on LinkedIn, there are these things called discussion groups. Most of us belong to them, some of us get invited to them without any anticipation or get add to them without our consent, which we’ll talk about, but these are the most powerful tools out there that can help us build our brand and grow our business. With discussion groups, you have the opportunity to engage with people who otherwise you may never be able to reach through gatekeepers, because one of the little secrets of discussion groups and I’m going to share this right now. Let’s say there’s somebody in your industry or some prospect you’d like to reach, because you’d like to engage and make them a customer of yours and you try to reach them through the traditional ways of marketing, so you try and email them, you try to send them shock and awe packages or you try and sweet talk your way around their gatekeeper, which as we know works a very small percentage of the time. Well, the little secret behind social media market is that same person who probably has hired somebody else to do their Facebook and do their LinkedIn and do this and do that and the other thing. They, themselves, having cleared out all that day to day social media stuff, so they don’t have to touch it, are still themselves participating inside discussion groups. People that I met inside discussion groups, it’s just amazing what’s done for my business and what it’s done for my brand. In fact, I grew my business almost exclusively by participating in discussion groups and having one of my own. So, that is awesome. Now, in the old days of the internet, the lingo was chat rooms, you know, everybody used to be these chat rooms. When you say discussion group, do you mean like a Facebook private group, you know, a group on Facebook. I know a lot of people are monetizing those groups and doing really well with them. It’s kind of, sort of, not, – you know, everybody thinks, oh, just go setup a fan page and spend a bunch of money with Facebook to go get likes and so forth, you know, they used to call it a fan page. It’s just a business page now, I guess, but is that what you’re talking about when you say discussion group? That’s exactly what I’m talking about. There’s a very similar function on LinkedIn. They may be truly private, which means no body can see them or they could be open, either way the idea is is you build a tribe and you build a community. If you’re founding your own discussion group, if you’re participating in somebody’s discussion group, then you are using that to attach more visitors and prospects and there’s a science and an art to doing it that’s very important for you to understand, because most of the forms of online marketing that work so well everywhere else, do not work in discussion groups if you do it the same way. Some of it almost sounds counter-intuitive, but when I explain the principle of Discussion Group Game, as I like to call it, and people see how this process really works, they discover that flying in the face of conventional wisdom is the key to having success using this platform and the best part of it and you alluded to this yourself is discussion groups on Facebook and LinkedIn are 100% free. You don’t have to pay for adds, you don’t have to deal with ad reviewers rejecting your ads claiming you’re selling tobacco or anything like that. You don’t have to worry about any of it. Yeah, very interesting. Okay, so, which platform do you like the best? I like them both and I think they both have their purposes. When I have somebody come to me saying they want to form a discussion group, particularly when they have maybe a couching or a mastermind program or they’re building a membership site, which is not to be confused with a membership program, because they are actually two different things and inevitably, yeah, then we have to get the forum installed and I’ll say, wow, wow, wow, that’s very interesting. So, what are you going to do with this forum? They said, well, you tell me, Adam, should we put it on LinkedIn, Facebook, should I put something in my wish list member site and I’ll say, I don’t know, do they want to speak to each other? See, that’s the thing and this is why so many forums and so many discussion groups fail is because we neglect to answer that very basic question before we get started, which is do they want to speak to each other? Well, the good news about discussion groups on platforms like Facebook and LinkedIn is people do very much want to speak to each other and the people who create and manage the discussion groups are doing it certainty to build their own business and build their own brand, but also create an unprecedented opportunity for you and I to engage as well. Okay, so, the first issue is then, I mean, we should start the discussion group or just be a participant in another discussion group or both? Well, we talk about both things inside our Discussion Group Game Mastery Blueprint, but if you’re just starting out, I would strongly suggest you begin by participating in other people’s discussion groups, because, first of all, you don’t have to create anything. Second of all, you don’t have to curate anything, and when you’re creating your own discussion group, there’ really a lot of work that goes into that and there are a lot of things you need to consider and a few very critical questions you need to ask yourself and be very clear on before you make that decision to go to Facebook or go to LinkedIn and setup a discussion group. Okay, so, if we’re setting up our own group, then how do we get members? I mean, how do we get the key people that we want in that group? That’s the important thing, to get the audience with those key target people, right? Well, there are about 7-8 different ways that we share inside our Discussion Group Game Mastery Blueprint, but I’ll give you a couple right now. One of which is put up an opt-in page. So, you use an opt-in page and you say, you know, join our group and we’re going to give you three bonuses, something like, so they go to this landing page, and fill in an email address and then you get taken to your Facebook group or your LinkedIn discussion group and at that point they’ll click the button that says request to join and if, you know, so long as they get approved to join the group, then it works just fine, but see, this is a great way to get people engaged, which you just a basic landing page and encourage people to enter their name and email address and then a direct stem to the discussion group to encourage them to sign up. So, not only are you getting more people in your discussion group, but you are also building your list and you’re building a tribe of people who are interested in you. In Facebook, yes, Facebook. It has over 18,000 members. Yeah, wow. That’s pretty phenomenal. I mean, he didn’t spend any money at all for that, did he? He probably bought some Facebook ads, because I originally connected to it because I saw a Facebook ad, but he was doing a lot of other things as well. He has a very large mailing list. He’s connected to a number of different online communities, so I’m sure it wasn’t all that challenging for him to do, but this is certainty something you can do without spending money on advertising if you choose not to. So you can actually advertise groups on Facebook, then. I don’t know that I’ve ever seen ads from groups. I mean, I see suggestions all the time, are those sponsored? It’s because a lot of people just don’t do it. This is one of the beauties of Discussion Group Games is so few people are focusing on it that there’s still plenty of room for your listeners to be zigging while everybody else is zagging wondering why their ad accounts keep getting shut down. So, while they are fighting with Facebook over ridiculous things that don’t even make logical sense. Like 20% text coverage. I mean, that’s just.. Right, exactly. So, other people worrying about that, you can be zigging and building a tribe. Fantastic. Very good stuff. So, you call this the ultimate selling without selling strategy right? Absolutely, absolutely. Let me tell you how that is. Folks come to me and they say that they hate selling or don’t want to sell or don’t want to do all that languagey type of stuff. The beauty of discussion group is it’s actually expected that you not be salesy. Most discussion groups will have rules in them. The best discussion groups will have rules such as: you’re not allowed to post links to anything. If you have something to say, say it in the group. Don’t try and solicit people in the group to do business with you. Don’t post ads. Don’t post affiliate offers. Don’t tell people about your webinar. Go in there ask and answer questions, help each other, support each other, mastermind with each other, and what’s great about this platform is it puts you in a situation, it puts you in a position where using five little words, you can completely take the entire selling proposition and stand it on its head. Yeah, wow. It really is, you know, it’s kind of like, if you look at the world of podcasting and blogging, which podcasting is nothing more than an audio blog, but it’s really selling through an editorial and educational and giving first kind of methodology and I think the discussion group philosophy of yours, it breaks down a lot of the barriers, doesn’t it? Because it’s just, you know, we’re having a chat. No body feels like they’re being sold or advertised to. I mean, would you agree that’s one of the big elements? I agree very strongly with that. I have found that playing in discussion groups and engaging your discussion group game is the easiest, most fun form of marketing you’re going to find out there, because you can do it from the comfort of your own, office, or home office any time you want, 24/7. You don’t have to spend money on it, you don’t have to go anywhere and you don’t even have to really think about what you’re going to say. In fact, if you wake up in the morning and you really have nothing to say, you can’t pull yourself together to write a blog post, my suggestion is, get into a discussion group that you belong to that is very active and just go in there, find out what people are talking about and contribute your two cents. What’s beautiful about being in the discussion group in this way, typically when it’s a very active discussion group with a lot of participation is in terms of content creation, it puts you in a reactive mode and most coaches and consultants, teachers and mentors, find that they do their best work in create their greatest brilliance when they are directly responding to a specific question being posed by a real person. So, we’re not after theoreticals and speak to your avatar. You have the person right there. They’re asking a question. Answer the question. It’s so easy. That puts you on your game. There’s no question about it, it definitely does. Well, that’s very good advise. Okay, so what tips do you have on, you know, if any, I mean, these are pretty simple, but on how you should name the group and the settings for the group. It should be closed, but no secret, I assume? Are there any setting recommendations? Here I’m really talking about Facebook, but you feel free to mention LinkedIn as well and by the way are there any other platforms besides those two that you recommend? There are a lot of others, but these are the two that we’ve gotten our best results out of. I mean, a lot of them have these types of discussion platforms, but these are the ones we see most often and these are the ones connected to the social media platforms that most entrepreneurs are currently using. The majority of everybody is on Facebook, LinkedIn, or preferably both as I am, so both platforms have very similar terminology. Sometimes the specific wording is different, but the functions are almost identical. So, we can talk about Facebook or we can talk about LinkedIn, it’s going to be substantially the same thing. You are drawing the distinction between a closed group and a secret group. A closed group, using Facebook as an example, is you can search Facebook for groups and if they’re closed, you can still find them in the Facebook search engine and when you find them in the Facebook search engine, you’ll be able to see who the members are, you’ll be able to see if the group exists, you’ll have a button there that says request to join group, but you can’t see the discussion unless or until the moderator approves you to join. Closed groups, when you’re using discussion groups as an engagement tool or as a list building tool are the ideal, because it allows you to screen who comes in and it gives you a much higher quality segment of people who are participating in a group. A secret group is for something like, let’s say you have a coaching and a mastermind program and you wanted to have its own discussion group or let’s say that you as a bonus to your recorded products, say you purchase my home study course and gain lifetime access to our top secret discussion group. Those types of groups, you can say there’s a secret group, it will not show up in the search engines and it will not show up in the news ticker unless that person belongs to it, so you can completely protect that from the outside. I use secret groups all the time for just collaboration with just my virtual work force and I think that’s, it’s pretty great, even though Facebook is not a legitimate project management tool, it’s pretty good, you know? It’s not too bad, but I’m really asking the difference, you know, do you make it public or closed? Does it feel more exclusive if it’s closed, is it better? Like, which one would you do to execute your strategy, public or closed? I would definitely use a closed group. I’ve seen cases where public groups work and in fact, a couple of discussion groups we look at as best practices are in fact open groups. However, for me, I like the fact that you have a community there, not just anybody can jump in. I like that there is a process of becoming a member where you have to request to join and you being a member is considered a privilege. It feels a little more legit that way too. Yeah, that’s good. Okay, so any tips on naming the group, because, remember, this is not, it shouldn’t have a commercial sounding name, right? Right. Okay, well, I can give you one global tip that covers pretty much everything. What I want your listeners to hear is that Facebook, LinkedIn, other social media platforms, I would like your listeners to start thinking of them as search engines and search tools that can be used to find business allies and prospects and customers for your business. LinkedIn has a very robust search tool, Facebook has a very robust search tool that allows you to search for groups. So, my suggestion is is you, just like you would do key word research to optimize a web page. Just like you would do, you know, research to optimize your ads, if you’re purchasing advertising. You’re looking for the key phrases, you’re going to do the same thing when you’re naming your group. Find out what the key phrase is that they’re looking for so that will come up in the search engine results and also make sure that you have an active vibrate group that will have a lot of activity in it. It’s just like optimizing a web page. You look for the key phrases that your audience is searching for and you optimize your page around that and then you regularly add fresh, relevant content so that the search engines will rank it more highly. Facebook and LinkedIn are search engines and they do not behave any differently. Okay, good. So, closed group, good tips on SEO there, because these are search engines, of course, just like anything else. What else would you like to say about it? Do you want to give any tips on how advertise it? I mean, I’ve setup many groups and Facebook never asked me if I wanna promote the group or do an ad or anything like that. Well, we covered some of that and one of my suggestion was is setup a landing page where people opt-in and after they opt-in, they’re taken to the page where they request to join your group. Yes, yes. A landing page on the web. I apologize if I was unclear. Yeah, you can put a landing page on your own website or put up a website that is an opt-in page where people enter their name and email address, they get added to your mailing list software and then as soon as they opt-in, they get taken directly to your group where they see the button that says request to join. And, if you’re doing it, say within Facebook, it looks kind of lame to have a group with five people in it, of course, right, so it’s sort of important probably to have some momentum at the beginning and invite a lot of people, isn’t it? Of course it is and all of the platforms have functions that allow you to invite people. The only caution I give folks is on Facebook, do not add members on Facebook. Invite members on Facebook, do not add them, because adding them without their permission is a great way to have them just leave your group, so just follow common courtesy. Inside the Discussion Group Game Blueprint we show you exactly how to do this, but a real simple way to invite somebody is just to when you’re on that discussion group on Facebook,when you’re on LinkedIn, look in the URL bar of your browser, because once you’ve seen the URL bar, that is the address of that discussion group. Send that link to somebody and say, hey, this is a great group, you should check it out. Promote it to your existing opt-in subscribers. Talk about it on social media, mention it in your podcast. Anywhere you’d typically mention something you’re looking to promote on an ongoing basis. I mean, look at, I mean, one example I like to use is Jason Parker’s List Building Club and then maybe of your listeners may be familiar with groups like Marketing Megaminds, Internet Marketing Super Friends, these are a couple of the other very large, very impactful groups that we see on Facebook. Another one is the Business Dojo, that’s another one I would encourage people to check out and then there’s another one called Your Virtual Assistant, which is for more than just VAs. It’s a very great group. These are several groups I’ve just given you, you may wanna consider checking out, looking at it from a Facebook perspective. Yeah, good, good stuff. Yeah. That’s great, great tips. Great ideas. This is very exciting. I mean, you’re teaching in a pretty nichy market. I don’t know that there are any other gurus out here that are really teaching these greats, seemingly like guerrilla tactics, you know? So, good job. Good information here. Well, as I said, look for ways to zig where everybody else is zagging and I participate in so many discussion groups. I have about a dozen that I check in with on a daily basis where I participate in the discussions on just about a daily basis and I would have to say in nine of the 12 groups minimum, one of the hottest topics of conversation is, why did Facebook shut down my ad account for no reason? So, while everybody else is talking about why their legitimate ads got shut down by an auto bot and getting no response from customer support and wondering what just happened to all the money they’ve spent, I’m just going to go on a play in my Discussion Group Game and creating engagement using five little words. Adam, I just got to ask you, you know, do you care to speculate on Facebook and their seemingly silly rules? I mean, God! It’s just so frustrating to everybody, you know? By the time someone listens to this. Exactly, exactly, and since you’re going to be out on iTunes and everything else, who knows how far and wide this will spread and if somebody picks it up five years from now, we could be in the world where personal profiles mean nothing, fan pages mean everything, and all ads get approved automatically no matter. You just never know. But the world we maybe in five years, Adam, will be pretty interesting because we may be meeting in these groups with holograms and virtual reality, you know, so who knows. It’s going to be an incredible, incredible time. So, let’s talk about webinars. I mean, you did really well with the webinar side of things and attracted a lot of people to your webinar, in fact, more than half, about 60%, through the discussion group without even mentioning the webinar. How do you do that? By understanding a very simple principle of Discussion Group Game, which is you’re not looking to use the discussion groups to market to people. You’re looking to use the discussion groups to connect to people. I did not go into the discussion groups and say, hey, I have a webinar coming up and I didn’t pre-seed my webinar, even talk about the fact that I did webinars. I went into the discussion groups. I helped people. I used five magic words to persuade them to make the decision to connect more directly with me. I became their friend, I became their LinkedIn connection, I became whatever it was. I engaged them. I found out what their issues were and then it just so happened I had a webinar coming up and they registered for it. That is the key right there is looking at where to introduce that conversation. You don’t go into discussion groups and talk about, well, I have a webinar coming up, because that’s promotional, you don’t do that, but you think about what is the real goal of being inside a discussion group. It’s to build your brand and grow your business, which means you make more connections, you draw people closer to you, you make yourself seen as a thought leader and when you participate, the correct way when you use the right language and when you exercise the proper level of restraint and exclude the proper amount of enthusiasm, you will find people drawn to you as their best friend, their ultimate thought leader, and you can have people who are way ahead of you in the business game looking to you as their guru and their mentor. Very good advice. That was excellent advice. So, what are you posting to get engagement in that group? Are you posting articles you came across, relevant to the topic, are you, you know, do you have a great way to ask questions. I find that questions are pretty engaging. Of course, it depends on the group topic and those may all be different, but any advice along those lines? That’s a sanction between Facebook and LinkedIn. With LinkedIn discussion groups where you frequently see people doing and we do this too, not only in our own group but in other groups that we belong to, is we post a link to a blog post, whether it’s our own or whether it’s somebody else’s as a discussion starter and there was a to do this with LinkedIn, there’s a way you build language, so it’s not like you’re promoting anything, but you’re posting it as a reference in the group and you’re encouraging discussion within the group. It’s not about hey, go check out my blog post, there’s a way you language that so that it sparks a discussion within that group. Facebook, generally speaking, you don’t see that. In fact, the best Facebook groups out there will not allow you to post any links of any kind, which means no links to your website, no links to somebody else’s websites, certainty no affiliate links, and even if you are talking about a resources. Like let’s say for instance I’m inside a marketing discussion group and we’re talking about, you know, somebody says to me, what is the best WordPress theme for putting up landing pages? I’m not going to say something like, I’m not going to post my link. I’m going to say, well, you know, I’ve found that I’ve increased conversions by 25% by using OptimizePress and here’s my affiliate link with a coupon. No. You just say something like, we’ve done well with OptimizePress. So, anything you recommend, people should be able to Google on their own anyway. If you’re looking to make affiliate income, I have made a lot of affiliate income by my participation of other people’s discussion groups, because just by being helpful in the group and sharing what I feel is a great way for them to proceed. If they decide that they like what I’m saying and I say the five magic words to them that cause them engage with me much more closely. In most cases I will say, alright, Adam, this is good, do you happened to have an affiliate link for this. In fact, just today alone, I was in discussions about various topics with two different people and even I said this to people where I’m thinking about buying some software and in one case buying a book and I said to them, you know, in case I decide to buy this, do you happened to have an affiliate link available? So, when you exclude thought leadership and you really play your discussion group game properly, you’re going to get to a position where people are asking you. That’s what the five magic words are all about and that’s what discussion game is all about, is turning the selling proposition on its head and creating a scenario where they are asking you, so you don’t have to ask them anything. Okay, so that leads to a really good point that you just alluded to is when setting up the group, what tips do you have on rules? Should you make some rules? The other question I have relating to that, you know, have you had to kick people out, probably you have. Absolutely. There are rules that I recommend and, again, it may be different for different groups, just depends on what it is and I’ve seen groups that I belong to that enforce rules that are actually contrary t what I recommend people do in managing their discussion groups. Now, my point about that is when you’re on somebody else’s playing field. You play ball by their rules. For instance, there’s one very influential group out there, one of the leading discussion groups in this space on Facebook and they specifically have a rule out that says I’m not allowed to use the five magic words. So, in that group I don’t do it. It’s that simple, because it’s their play fielding, their rules, but other groups allow me to do it. So, I do it just fine. Always check the rules and when you’re managing a group, always post rules. Some of them may include, don’t post links, don’t argue with people, don’t tell people they’re wrong, because the last thing you wanna do and if you’re telling people they’re wrong or you’re saying, you don’t know what you’re talking about or whatever, my thing is basically, what you should do is is call them out as a troll. Inside the Discussion Group Game, I have specific languaging you can use when you find yourself in a situation with somebody that mostly people who troll and flame discussion groups are attention seekers and they can be ignored or set aside. People get all worked up about them. I personally used to get really worked up about them, but there’s a way you language it where you can express multiple different view points even if your view points are diametrically opposed to somebody else’s without in anyway becoming a confrontation and I would say, in the rules, a real important rule is be nice and another very important rule is that the rules are the rules and we don’t make exceptions and as a moderator you have to be prepared for that. Here’s something we see a lot in business and this is a compromise that businesses make all the time. You absolutely can not make when you’re running your own discussion group. Jason, do you or somebody you know, have you ever said, well, you know, there’s something that I never do in my business, but I’ll make an exception for it, because this person is a whale. Okay, so you know what I’m talking about, right? So, let’s say you have a rule in your discussion group that says, don’t post links, but so-so comes in and starts posting links to their stuff, you don’t say, well, I know we’re suppose to have a no link rule, but they have a really big list and they may want to do JV with me. No. The rules are the rules. If they can’t play by the rules, they gotta go. So, you gotta treat them just like anybody else, because when you start playing favorites and start being inconsistent and you start enforcing the rules whenever you feel like it, instead of consistently, then you’re going to have massive break down inside your group and your group will die, because the best people will just leave. Whenever I am in a discussion group and I start to see blatant favoritism or I start to see people being singled out, whether it’s me or whether it’s somebody else. I pack my toys and go play in another field. Simple as that, because yes, it is true, that other person owns that discussion group, because they’re looking to grow their business and I’m utilizing their space to build my business and grow my brand, but at the same time, they depend on me too, because without me, they don’t have my engagement and they don’t have me being on podcasts like yours making lists of what I think are the top discussion groups right now and mentioning their name. Right, right. Yeah, very good point, very good point. So, you mentioned those five magic words you can’t say. Do you remember any of those? I’m kind of curious, what kind of words are you talking about there in that one group? Let me explain what happens when you say add me and message me. Instead of coming out of the blue and sending them a friend request or a connection request. You don’t put them in a situation where they have to accept or decline your request. Like, me personally, I have less than a 1,000 Facebook friends, but I’m very proud of the fact that I know where every single Facebook friends came from. I mean, I can look at any of my Facebook friends and I can tell you where I met them, I can tell you what discussion group I was in or who’s discussion thread I was on where I engaged them or what I was doing at the time where they liked me and sent me a request or vice verse. I know that about every single one of them. In fact, one of my assistants send me random lists on my Facebook friends and I have to reply to her and explain how I know them, just to keep them sharp on this points. So, I’m very proud at that. Now, somehow, if you just assume that because you had a nice conversation with somebody inside a discussion group. Maybe they don’t really want to be your friend. Maybe they just wanted to answer their question or maybe their near their 5,000 or maybe they need to keep a 1,000 spaces open, because they have a growing coaching program and they need to have the best to be friends with everybody who pays them money. So, you have to think about these things and with LinkedIn, you also have restrictions on how many connections you can have before you have to start paying for LinkedIn, so you have to be cognizant of that as well. So, you’re not imposing on anybody when you say, “Add me and message me.” So, if they feel that you are somebody who can strongly help them and get more of what they want out business and life or whatever it is their looking for, they will send you a friend request and they will send you a connection request and when you say message me, that’s where you take the entire selling conversation and turn it on its head. So, instead of, you know, you’re in the middle of a conversation on discussion group and all of a sudden you start private messaging them and saying, hey, you know, it’s starting to get crowded in the room. Let’s go talk over here. When you say, “Add me and message me.” Not only are you putting on them to make the decision to engage with you, but you also inviting them to get more of what it is you offer. Good tips. Hey, give out your website and tell us where we can get the Game Plan. What’s it called exactly? The exact name again? Okay. What I invite all your listeners to do is to go to www.BusinessCreatorsInstitute.com. If you Google the phrase Business Creators Institute, it should come up number one on Google. Go there and create for yourself a free membership and we have a lot of resources available at the entry level. We have some of our guides and worksheets. We have technical tutorials and we also have a collection of teleseminars and webinars that we recorded and one of them takes the Discussion Group Game concept and goes into in greater detail. So we have additional resources just for your listeners, so if you log in to the Business Creators Institute, create a free user name and password, and you can access the free training available on Discussion Group Game and then we have an advance version of it, which we call the Discussion Group Game Mastery Blueprint where we take all of this stuff and we break it into much further detail where we walk you through how to use Facebook and LinkedIn as search engines to find the discussion groups, how to join the discussion groups, the language you use once you enter the discussion group to set yourself apart as a thought leader rather than just another sales person. How to use the five magic words and how to setup your own discussion group. Like, we walk you through the steps of making the right discussion about forming a discussion group, why you’d want to do it, the things you need to be aware of, some of the cautionary tales before you make the decision to invest the time and the effort and then you will watch on screen while we setup discussion groups in Facebook and LinkedIn. You’ll actually see me do it from a technical perspective and then we talk about in greater detail some of the things we’ve discussed on our call here today such as how to tie in discussion groups with your list building, how to use them as a customer retention tool, how to draw the distinction between whether or not you should have a closed group or a secret group, and so much more. Yeah, good stuff. Good information. Well, Adam, thank you so much for sharing all of this. This is like a freight train of information, but I tell ya, I think this is just an easy no-brainier, you know? It’s really easy to execute on. Once you execute on it, it’s going to take on a life of its own and you’ve shared some really good ideas with us today. So, we appreciate that. Any closing thoughts? Somebody in there wants to give you a $1,000. You gotta find them. But the fact is that is where you will find them. Yeah, right, right. That’s your job. That’s right. Good, good point. Good stuff. Hey, thank you so much Adam.